Below is information about the "Birthright" asylum on InsaneJournal. To join this asylum, click here. You may leave the asylum at any time. On its four-year anniversary, the cast of Birthright brought its desert adventures to a close, after writing 5,088 pieces of fiction. We are grateful to have been part of such a community. 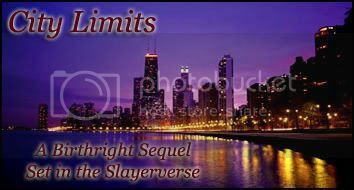 Our story continues in City Limits: A Birthright Sequel and Slayerverse RPG! We hope you'll make the trip to Chicago with us. 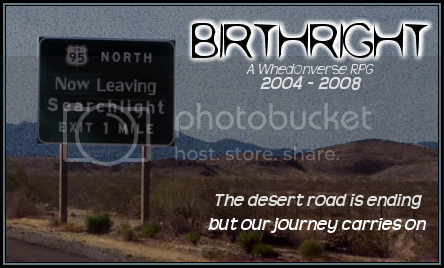 Birthright is a fictional, fan-run, not-for-profit writing community. We are not affiliated with Fox, Mutant Enemy, Joss Whedon, or any other entity which owns or may own part or all rights to the concepts of Buffy the Vampire Slayer or Angel the Series. Community background photos by Carley Clifford. Some of the graphics used for our home page and by our writers have been found on the internet. Any request by the artist to credit or remove these graphics will be honored. As for the town of Searchlight, any charactors resembling real persons, living or dead, is purely coincidental.